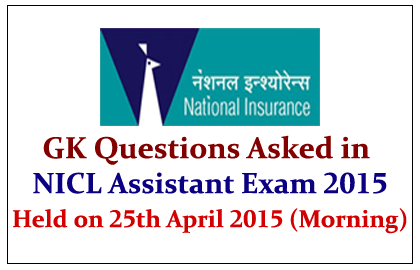 List of GK Questions Asked in NICL Assistant Exam held on 25th April 2015 (Morning Batch) was given here below. Candidates whose who are preparing for the exams can have look on it. What is the Venue of ICC World Cup 2023? Who is the MSME Minister? World Health Day is observed on? What the headquarters of WHO? Which of the following film has got National Award for providing wholesome entertainment? What is the name of the Auto Biography of Milkha Singh? In Kisan Vikas Patra Money will be double in how many months? What is the maximum limit in Sukanya Samridhi Yojana in one financial year? Michael Pheleps is related to which sports? Among the following who has won Dada Saheb Phalke Award?